Think you can’t start a business? If this guy can do it, so can you! The inspiring story below is written by Munyuki Manatsa, a Zimbabwian tech graduate and now young IT entrepreneur who turned an 80% unemployment rate into an opportunity to create and launch his startup, www.mixdem.com. He did this in 3 weeks while battling obstacles such as no money, no electricity and no internet connection. Below his story, I have added a few takeaways we can all learn from. Enjoy! After my last interview with a big mining firm, I got fed up. I had gone to many interviews with big companies, and the result was always the same. With unemployment at a staggering 80%, one can imagine the stiffness of the competition, now add corruption and your chances are next to none. I graduated with a Bsc Information Systems from Midlands State University of Zimbabwe in December 2009.When I graduated I had high hopes of a good job – two years later I realised that no one was probably going to give me that chance any time soon. Confronted with a not so rosy future , I decided I was going to build a web application. I had read so many stories, so I was optimistic, plus it was the only chance that I had to be noticed. I needed an idea , so I brainstormed a couple of ideas but none of them interested me. Then it dawned on me that I needed to solve a problem that I had experienced. If people didn’t like the idea , I would just use my application for my own good. I visit a lot of hip hop sites and sometimes a site might have only one good story. I decided to build a hip hop link aggregator with social networking features. It would also give me an opportunity to sharpen my programming skills. My programming skills were a bity rusty, I did not have a internet connection, there was no one to help if I encountered a problem and I did not have a debit or credit card to purchase a domain name or hosting. It seemed impossible but I had no choice. First, to solve the domain name problem, I contacted a friend who had a debt card. He purchased the domain name www.mixdem.com for me. With that solved I searched google for a good free webhost and found Capnix. Having purchased the domain name and found hosting, I began development of the website. I would work mostly during the night because during the day the would be no power most of the time. When I encountered a challenge , I would work at it until I found a solution. I would go to the internet café to download websites that I needed to scrape and also search for solutions to problems that I had failed to solve. Implementing the social networking capability was difficult but I managed to pull through. It has features like voting on content that you like, you can follow people like on twitter, share your thoughts, comments, algorithms to rate content and messages between members. Three weeks later I had a working prototype and was ready to test it. I now wanted to launch. I went to the internet café and created an account with Capnix Hosting. I logged to my Godaddy account and set the nameservers to point to my Capnix account. I uploaded the website and set up the database. Then I waited for the nameservers to propagate. After two days I checked and the website was not yet accessible. I had made an error in created the account so I had to do it again. After hours of trying to figure it out, I finally managed to set it up and my website was now visible. The time to promote the website had come. I set up a Twitter account and engaged with the hip hop community there. I also posted on Facebook about the project and a couple of classifieds websites. I was just looking for feedback and was not expecting a lot of traffic. About a week after the launch, the response has been humbling. Considering that I did not do much marketing other than tell few friends, the site had 500 unique visits which is quite impressive. A lot of people have contacted me with business ideas and others want me to freelance on their projects. As a result of this project, my future now seems bright and I have started getting a lot of opportunities that I did not have before. If you find yourself in a position like me, don’t lose hope – instead start a project and tell people about it. It doesn’t have to be perfect. [Tweet this] And use all the resources you can get! Munyuki refused to be a victim. He decided to take action! He focused on solving a problem – finding good content about hip hop. He leveraged all the resources he had – and even some he didn’t! He persisted in spite of obstacles – no electricity, no money or credit cards and no internet connection. He launched a minimum viable product – and got it out there as soon as he could. He has got something up and running and so is now building momentum and finding new opportunities. Munyuki needs to find a way to monetise his site. 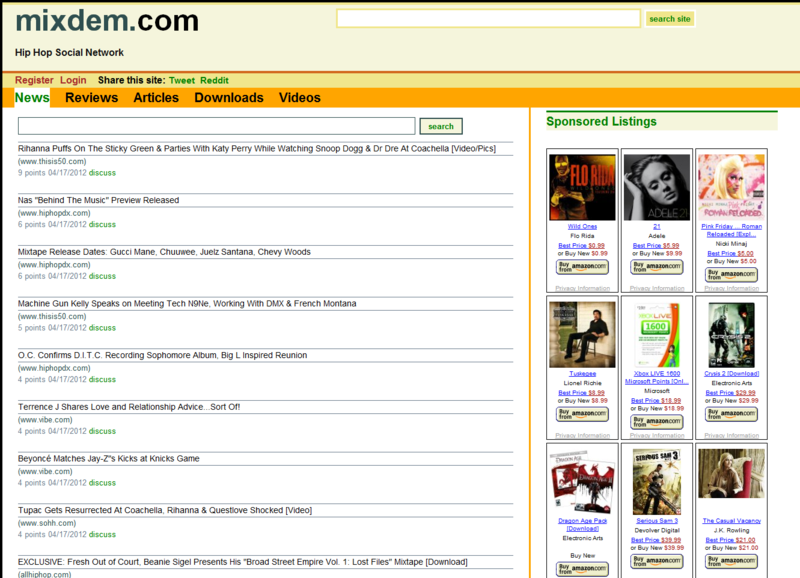 At the moment he has Amazon affiliate links to music albums, which is an easy and logical way to start. Over time, he will discover if this provides him enough income or if he needs another strategy. Possible alternatives could be advertising or sourcing products that DJs and hip hop artists use and selling those. The upside is that if the traffic continues to build to his site and he continues to interact with his audience, he will learn what they need and find ways to provide it to them. He will need to find ways to encourage readers to engage on his site and especially ways to keep them there, rather than send them off to other sites. This is one of the inherent problems with an aggregator site. Munkykim can look for best practices on other aggregator sites and use some of the strategies that seem appropriate to his target market. I think this is an incredible effort and look forward to seeing what mixdem.com evolves into. I’m sure with Munyuki’s passion and persistence, he will do something worth noticing. Give him some love and visit his site and his blog. What did you learn from Munyuki’s experience? Is there anything you want to apply to your own business? Do you have any tips to pass on to him? Thanks for the valuable feedback , i will try to address the points raised. You are welcome! Keep in touch and let us know how you are going – and also if there is anything I can do to help. Thanks James. It is a great story isn’t it. I can’t take much credit though. 🙂 I republished Munyuki Manatsa’s original post (with his permission) and added some thoughts of my own. Great article..not only inspiring but transforming of mind set as well. susan i love for this post,coz i have been greatly challenged to finally finish my business plan and i know it is a success. Fantastic! Inspiring! We love it! This is truly inspirational. In light of the difficult economic conditions of Zimbabwe, what Munyuki has done is a great example of determination! Great stuff Susan! Great story from the lands of dim opportunities. Inspiring enough and your take-away points from the story are spot-on. I can add to this with my own true story. Two years ago I set up http://www.aotearoa-artist-trail.co.nz and last year I set up http://www.communityinfo.co.nz both based upon solving issues due to my own experience. I am about three weeks away from launching my first online store. Neither earn any revenue at this stage. As I earn a living as a self employed consultant, I have been content to spend the past couple of years learning about how to utilise social media, develop good content and listening to potential customers. As a result the CommunityInfo website is on its second version and the Artist Trail website is about to flip its business model on its head. 2015 is going to be a great year. All three websites will begin to generate revenue. I’m not a young Gen Y, I’m a tail-end Baby Boomer taking advantage of opportunities that didnt exist when I commenced my working life. My advice is to follow the Nike slogan and ‘Just Do It’. Forget the business plan, forget making a perfect website, forget pitching for venture capital. These all come with experience and time. Make a rough and dirty website and get it online and keep improving it, over and over again. Only then can you really work towards something that will become a sustainable business. Remember you have to be in this for the long haul. There is one other advantage. By doing all this myself and learning as I go, when it comes time to hand part of the work over to someone else or to a subcontractor I will know sufficient to ensure I am not being conned. People are welcome to contact me with questions but please, no guest bloggers or offers of backlinking. These will be ignored. Thanks for sharing your story John – and good luck with both your ventures. Its amazing how biz ideas can be developed and really this shows that if you really have the passion for something u will finally get it done. I have a biz idea which i want it developed and I was reading an ebook by James Altucher called Choose Youself and this book generally is also about how you can develop biz ideas and make it a success. In the book one of the ideas was to such twitter to see what others are doing. Honeltly I rarely use twitter but I decided to search it for once. Little did I know I will be led to Susan Jones website and get really motivated. I seriously would wish you to coach and I am determined to sign in by end of August.